I am in the midst of a deep love affair with the moon. Can you tell? She and I have always been close, but recently we have taken things to the next level. It's serious, you guys. Every time I put pen to paper, a moon seems to find it's way to the page. I have moon magic on the mind. I think, as a species, we are hard-wired to love the moon. She and the stars were our first calendar after all. Our first discernible method for knowing when to plant seeds or hunt or harvest or get married or baton down the hatches. Ruler of the tides. Our companion in the darkest hours of the night. The thing every-single-human-who-ever-lived-in-all-of-history has in common. Our nightlight. Our sister moon. Tracking the ebbs and flows of the lunar calendar is a lovely way to stay connected to the rhythms of the natural world during the long dark days of winter. It also helps set clear times each month to start and finish projects, give thanks, check in with ourselves and manifest intentions. If this resonates with you, and you haven't checked her out yet, run (don't walk) over to Chani Nicholas's amazing blog. This woman is a mystic moon mama / lunar guru who has changed the way I connect to the night sky. 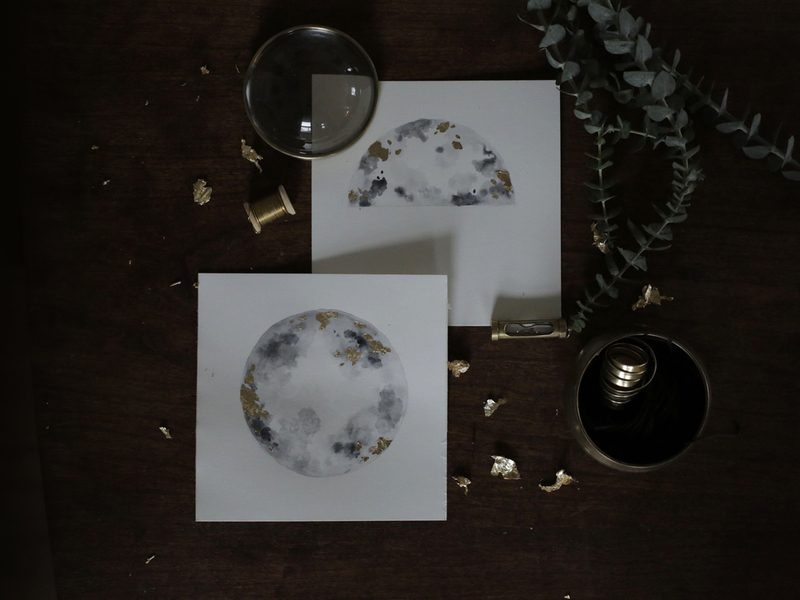 I am a big fan of marking occasions, and pretty much any excuse to use gold leaf, so to honor this Saturday's full moon, I pillaged my craft drawer and created these delicate paper moon phase flags. This is one of those projects that is very forgiving and soothing to work on. A creative meditation of sorts. Light a candle, put the kettle on and curl up with the moon for a spell. 1. Start by tracing something circular very lightly with a pencil to get the shape of your moon on one of your pages of watercolor paper. I used a roll of masking tape as a guide and chose square paper so that I wouldn't have to worry about cutting the flags to an even size. 2. Start filling in the circle with water with a wet brush. Slowly add little blooms of watered down color (I used grey) around the edges of the circle. Let dry. Repeat, allowing the layers to instersect and flow into one another. 3. Now you can start adding some darker splotches of color for depth. Play with using less water and more paint on your brush to create craters. Layering is key. Let dry between layers. Experiment and play. My only advice would be to only add a little paint at a time and know when to stop...it's easy to go too far. I found that I liked mine best when I left a little white space within the moon. What I love about this project is that it is very forgiving. If you make a mistake, just add a little water. Easy peasy. You can also use a dry brush to brighten areas if they start to feel too dark. I haven't used watercolors in ages but I could see how they could be very addictive. So calming. 4. Repeat process with the rest of your moon phases, using a pencil to shape out the area you will be painting for each phase. I only created 7 phases (including 2 new moons) but you could easily add as many phases as you'd like. To create the new moon, I simply splotched* (technical term) my brush around the outside of my masking tape to get this effect. 6. Once all your phases are totally dry, get a clean brush and apply a small amount of the adhesive size to the areas of the moon you want to gold leaf. I found that asymmetrical brush strokes looked the most "moon-like" when the leaf was applied. Let size dry for 10 - 15 minutes or until clear. 7. Apply gold leaf to the clear adhesive size. The leaf should stick only to where the adhesive was painted. I just used my fingers to apply it, taking little scraps from here and there to make interesting crater shapes. Use a soft paintbrush to gently brush away the extra gold leaf. Again, work in layers as a little gold goes a long way. 8. Punch holes in the top 2 corners of your moon phases. I used a jewelry hole punch to get teeny tiny holes, but a regular hole punch would also work. 9. Carefully string your phrases together with twine or ribbon. Be delicate as you work, it would be easy to rip the paper. I used a little bit of candle wax on the end of my hemp to help make threading it through the holes a bit easier. Worked like a charm. Feel free to add beads or tassels or feathers to the end of your flags if you are feeling extra fancy. When I finished my flags I realized how easy it would be to slip them into a pretty envelope and send to a far away friend. Spread that luna love. Thanks for stopping by lovelies. Have a lovely cozy lazy wonderful weekend.